October 16th of this year has become for us, the Annunciades, a memorable, historic day! On the occasion of the 550th anniversary of the birth of St. Joan of Valois, we joined the Sisters of the French monasteries in Villeneuve-sur-Lot, Thiais, and Brucourt, in a pilgrimage to places associated with our Founder. His Excellency Michel Santier, Bishop of Créteil, to whom we are all grateful for granting permission for this unique journey, went along with us. In Lignières, Sisters from the St. Doulchard monastery warmly greeted all the pilgrims. Holy Mass presided by the Bishop of Bourges, Armand Maillard, began approximately at 11:00 a.m. The homily was delivered by Bishop Michel Santier. Many parishioners, friends, children, and young people from the group “Troubadours of Peace” participated in the Eucharist. (This group is organized and run by the Sisters from St. Doulchard. Their meetings are intended to deepen the spirituality of the Annunciades). The liturgy was beautiful and well-prepared. Before Mass, we had the opportunity to go to the oratory and to pray briefly. 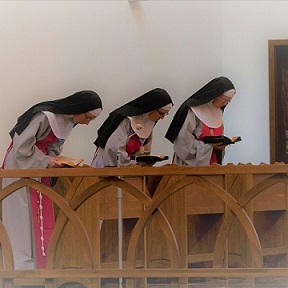 The Sisters could not all fit in there at once, and, therefore, the Sisters formed “a queue.” Each one had a chance for a brief intent recollection at the source of our spirituality. We all were moved by the thought that this was the very place where it all began, and today, so many years later, the Annunciades continue to live out the Marian spirituality left to us by St. Joan and to imitate Mary in her evangelical virtues to please Christ! After lunch, we went to Bourges. There, we prayed at St. Joan’s tomb in the chapel of the first, no longer existing monastery that she founded. We recited the Decade, and prayed for all the intentions of our Order, our Confraternity and friends, as well as for the Franciscans and the Marian Fathers. Vespers were recited at the monastery of St. Doulchard, after which we met for communal dinner and recreation. We returned to Thiais late that night. We give thanks to God for the graces received through the intercession of St. Joan not only on that day, but throughout more than five centuries! We also give thanks for future graces, which – as we believe – shall be abundantly granted to us!